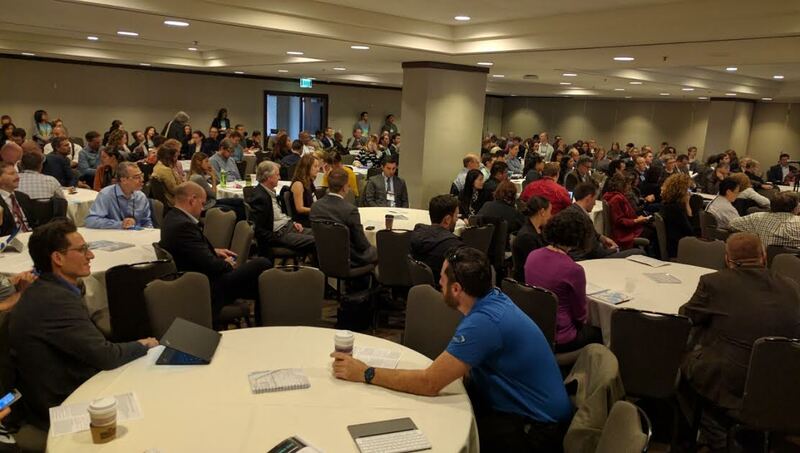 The Rail~Volution conference at the San Francisco Hyatt concluded yesterday with three hours of presentations and break-out meetings about California High-Speed Rail. The focus: how to build the communities we want around HSR stations in Los Angeles, San Jose and Fresno. An important part of that was to learn from the experts: the French designers who have already developed and built beautiful, place-making stations in Strasbourg, Lille and other cities in France. High-speed rail has transformed cities and regions around the world. Now it’s our turn. California has begun its ambitious investment in high-speed rail. How our we building our high-speed rail stations? What can we learn from France and other countries? How can we put those ideas to work in Fresno, San Jose and Los Angeles? Hear from national and global experts on issues related to design, governance and balancing major new transit infrastructure with the land use and development opportunities created by high-speed rail. Before heading to the breakout sessions for details on the planned California stations, attendees heard from some domestic experts. 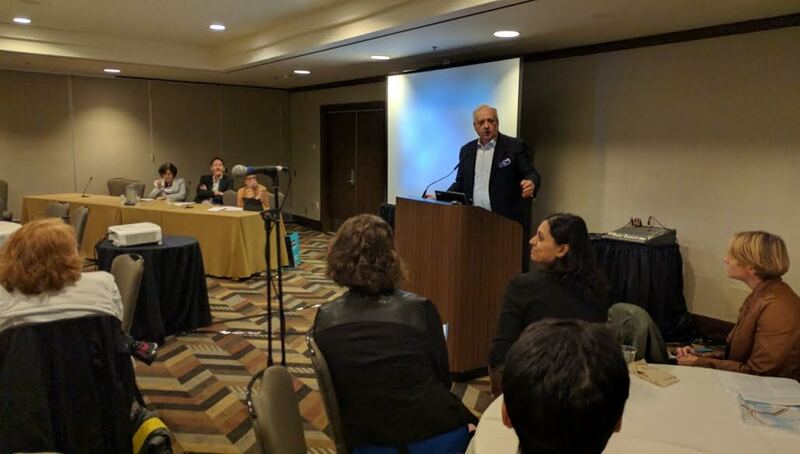 Robert Cervero, Professor and Chair of the Department of City & Regional Planning at UC Berkeley, said that HSR has its biggest impact on certain economic sectors, including “…finance, business services, consulting firms, architects, engineers–those who depend on face to face contact,” he said. And that, he explained, means HSR will have the most impact where those types of firms cluster, such as the central business districts (CBD) of San Francisco and Los Angeles. “HSR will allow things that take place in a CBD to flourish,” he said. He also said it will help San Francisco and San Jose businesses access a larger labor market, since it will enable people to commute from farther away. However, he cautioned that, going by examples in Japan and Taiwan, impact will be less impressive in secondary cities. “It’s not to say you won’t get wider economic benefits, but the bigger impacts will be in the CBD of the [big] urban centers.” But, he cautioned, that can also lead to more sprawl if developers build the wrong kinds of communities around stations in exurban areas. And all of that, he said, is key to fighting greenhouse gas emissions, by electrifying California’s–and then America’s–transportation system, from electric cars, to HSR, to local transit. “We are blessed with solar and hydro power in California,” he said, to power the expanding systems. It’s quite a vision. But, of course, first thing’s first–and key is developing and expanding HSR stations that will become focal-points of their cities. 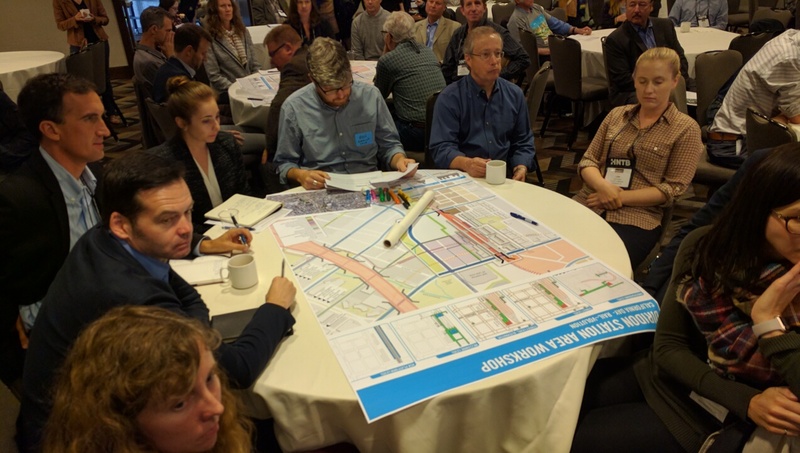 Rail~Volution attendees broke into groups that looked at developments at Union Station in Los Angeles, the HSR station and linkages that will be developed in Fresno, and the work to prepare Diridon Station in San Jose. Diridon, like Union Station in LA, has the challenges of integrating LRT, Metro rail, commuter rail, bus services and HSR, while striving to keep everything pedestrian friendly and connected to downtown. 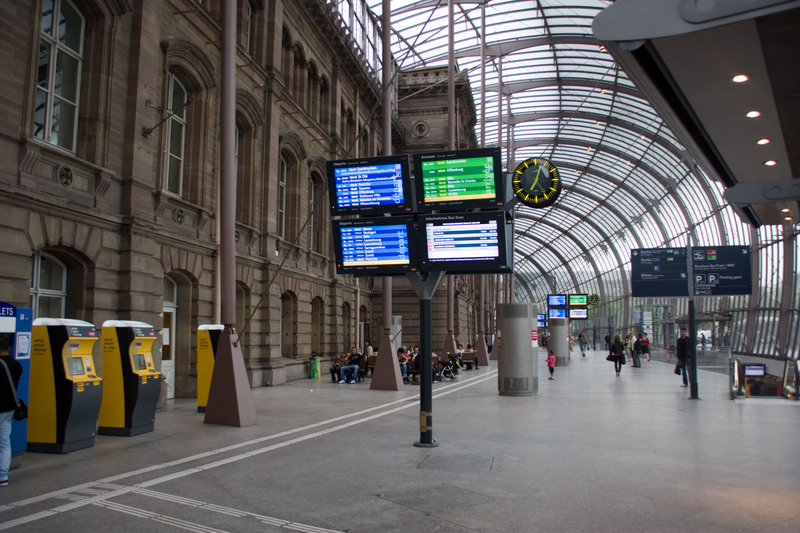 Etienne Tricaud, Chief Executive Officer of AREP, an engineering consulting firm in Paris, talked about the challenges of expanding Strasbourg station for the arrival of the TGV (Train à Grande Vitesse) in 2009. AREP had to integrate the Metro/LRT systems with the TGV, but without destroying the historic frontage. That was done by building an arching, glass shed over the front of the station. “It gives protected access to underground transportation, Metro and the car park,” he said. 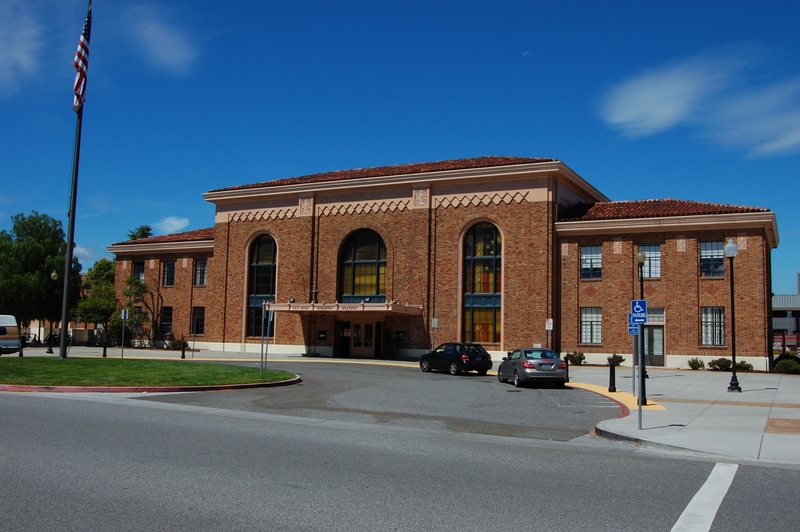 “Before they had to walk outside in the wind and rain.” While wind and rain are less of an issue in San Jose, one can imagine a similar approach to expanding Diridon, to give a comfortable, air-conditioned envelope to travelers waiting for trains and making connections. He also spoke about the TGV and Eurostar station in Lille, France. Engineers wanted to build a station many miles from the city center, to avoid curves and keep the trains running at maximum velocity. But the mayor of Lille fought for the station. Today, the TGV and Eurostars running between London, Paris and Brussels are visible from the city center through a large glass shed that envelops the platforms. Express trains that don’t stop at Lille flow through the curve and through the city center seamlessly and quietly. And, as hoped, the station is a destination in itself, and an integral part of the city. “We have over a million square meters of office, concert hall, retail, and housing space around the station in Lille,” said Tricaud. Can California’s HSR system revitalize the centers of San Jose, Fresno, and other cities on the route? As Richard put it, “Every technology is a tool that can be used for good or harm. An HSR system can be a revitalization tool and it can be a tool to concentrate development in a sustainable way.” The only thing that worries him, he said, is the possibility of doing it wrong. And key to doing it right in California, in Streetsblog’s view, is to continue studying mature HSR systems all over the world. But, he cautioned, that can also lead to more sprawl if developers build the wrong kinds of communities around stations in exurban areas. It’s a good thing California isn’t making that mistake. To be a little contrarian for a second: would it be the worst thing in the world if people lived in “sprawl” development in the inland parts of the Bay Area or the IE or the Central Valley and then used HSR to access well-paid jobs in downtown SF, SJ, or LA? I mean, let’s face it, sprawl development is pretty much already the de facto affordable housing strategy in coastal CA. If there were HSR, people living in areas with reasonably priced housing could access many more jobs and could do so without enduring white-knuckle commutes on overcrowded and dangerous freeways. If we take it as a given that the Bay Area and LA aren’t going to be able to keep housing prices in check–which I pretty much do–maybe the best answer is to make it easier and faster and safer and more environmentally friendly for people to commute from further away. And then to try harder to make sure that “sprawl” developments are built as complete communities rather than as disconnected subdivisions. From the perspective of economic development, turning inland cities into HSR-linked bedroom communities to coastal jobs only is not a complete or great plan. Take your Bay Area corporate lawyer who can’t afford to buy in Woodside, but could get that 5 acre ranch of their dreams in outer Fresno, that would ultimately offer minimal employment in Fresno (some domestic help, landscappers, maybe equestrian specialists) and little opportunity for progress. Compare that to vocational programming for someone already in Fresno who needs timely access to San Jose interviews, or the whole bunch of skilled trades who could become HSR technicians for the nation … not unlike the Siemens factory workers in West Sacramento. So really it isn’t about “sprawl” or not, it’s about equal access to the opportunities HSR presents. I would like to suggest small correction or clarification: The column mentions AREP, as an “engineering consulting firm in Paris”; whereas in fact, AREP (Aménagement Recherche des Pôles d’Échange, or Exchange Hub Development Research) is the Paris-based design affiliate of French Railways SNCF. While offering the full gamut of station and station area engineering services, as well as urban and regional planning, landscape, interior, and industrial design services, AREP’s primary focus is station architecture. 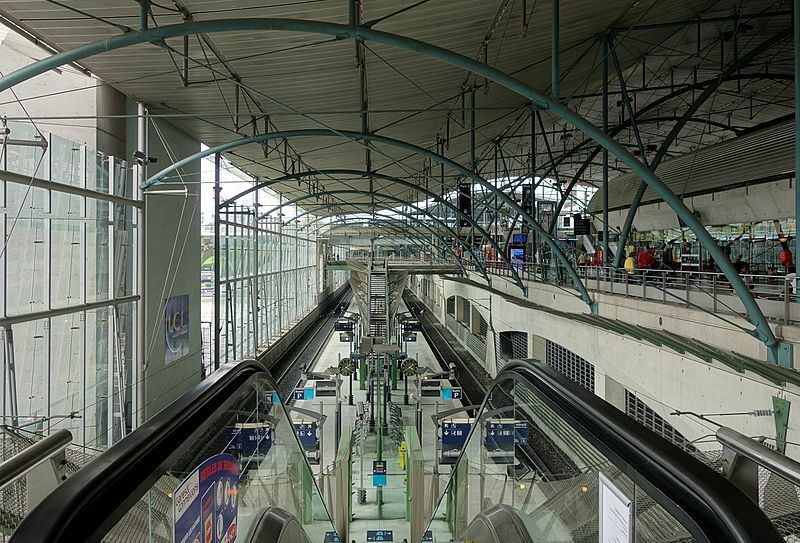 The core group of AREP’s design professionals pioneered the art of modern station design in the age of the TGV and continue to this day as a laboratory in the study of modern mobility. It would be very bad to just propagate the suburban sprawl model. It has been proven to not be viable with large populations. If we lived in a more or less no growth world, I’d say “Sure, go ahead and sprawl!” However, that is NOT the case. What is viable in 10 years, we KNOW won’t be viable in 30 years. So, it is far better to plan for the future instead of just build according to models of the present. You can already look at the design of the Orange County ARTIC station and see that it fails certain essential criteria of successful station design. The best thing is probably its physical shell design, but its distance from the tracks, tie-ins to the community, business integration, and range of services provided all are signs of failure. Quick answer: Yes, more sprawl would be very bad. Besides the problem of consuming important farm land, it takes too much infrastructure to serve a sprawl community. The tax base can’t cover the normal costs of maintenance and repair for the sewers, roads and water pipes. On the other hand, the poor people in the denser inner cities do generate enough tax revenue to more than pay for the infrastructure, which is smaller per taxpayer because of the closer distances. So the poor people are subsidizing the wealthy estates. Revitalizing the center city makes the area more attractive to upper income people looking for easy access to restaurants and cultural assets, attracting a wealthier population to the city, where lower taxes will be enough to fully cover the cost of the resources that they use. Farmland is dependent on water, and not housing needs. Infrastructure is largely already present, and not overburdened as it is in urban areas. Go ahead and revitalize your center city, but please quit proposing that this is a zero sum game. There will indeed be growth in urban, exurban and suburban areas. And transit needs will follow all these paths. It’s not a zero sum game. It’s a negative sum game. Sprawl suburbs with a low taxpayer density routinely return less than 50 cents of revenue on each dollar of maintenance and repair cost over the life cycle of the infrastructure. The growth of single use development adds an ever increasing burden of debt and deficit to the city’s budget. That’s why it is vital to improve the center city to attract higher value citizens into a denser core where the infrastructure can be paid for with lower taxes. Otherwise the city will never be economically viable. Without facts to back up your supposition, this is a misrepresentation. Cities are already viable. And the large areas outside of cities are also viable. Cities simply cannot and should not attempt to corporate all of the population. Indeed, many struggle now. We will grow new cities, and some non-urban areas are the seed-stock. “Higher value citizens”? That sounds a little like social engineering to me. A lot of “sprawl” doesn’t happen in cities at all but rather in unincorporated areas. And those areas are often more attractive to developers, investors, businesses and residents because of lower taxes and fewer regulations. Yes, tax revenues will be lower in those areas but that is why they are more attractive. It’s cities that pass things like parcel taxes, building codes and rent controls. Places run at the County level experience less government meddling. And services are usually cheaper to run than in cities. Policing is done by the County Sheriffs, for instance. Cities are typically more extravagant, ambitious and bureaucratic with their services and so require higher taxes. There’s a reason why cities sometimes try and appropriate the surrounding unincorporated areas. They get extra taxes coming in but less demand for services there. Many people want a low-rise lifestyle where everything is convenient, there’s a front and back yard for the kids, good, safe schools and so on. And elected officials get re-elected by giving the people want they want. Claude, comparing the tax revenues from incorporated and unincorporated parts of counties doesn’t strike me as a meaningful comparison. I’m not comparing incorporated vs unincorporated, I’m comparing revenue vs liability. I speak from a Republican bias, quoting principles from a Republican who has worked in urban infrastructure and seen how it works. I’m glad the cities are all viable. Detroit will be even happier when you tell them how great they’re doing. No, I think your comparison is flawed. Most of what you call “sprawl” happens in unincorporated areas. And developers, investors, businesses and residents often prefer unincorporated areas because they have lower taxes and fewer regulations. Outside of cites, things like law enforcement are provided by the county, enabling taxes to be lower. It’s generally cities that pass parcel taxes, rent controls and building regs. Then there is the little matter of what people prefer – often that is front and back yards, good, safe schools, big box stores and convenience – all features of low-rise neighborhoods. And Detroit? Really? That’s your poster child for our future? for everyone; so the roads are potholed, bridges are crumbling and water mains leak as a routine part of our lives. We don’t generate enough revenue to pay for maintenance and repair, regardless of whether city or county pay for it. People like front yards, back yards and safe schools, but they also like to live near work, shopping, entertainment and cultural assets like parks, libraries and museums. Given the choice, most people would like to live in Mayberry, but you can’t build like that under most zoning laws. And no, Detroit isn’t my poster child, it’s yours. An entire city of low rise, low density sprawl, with urban freeways cutting through the center of the downtown area to reduce density and restrict the internal circulation of goods and services. Just west of that is Ann Arbor; a dense, compact urban center with plenty of closely set single family homes on the fringes, and the freeways run around the outside rather than through. You can try and engage in all the social engineering that you want, but people know what they want, where they want to live, and what kind of neighborhood they desire. Politicians who ignore the voters and instead try and ram monolithic planning mandates onto them will find themselves out of office soon enough. Where did all the white folk in Detroit go after the highways broke up the central district? Was the city abandoned by everyone with enough money to leave when enlightened social engineering made it impossible to live in the city? Why did they go to places like Ann Arbor where the center of town was still livable and beautiful sprawl was minimized? I don’t consider giving people a choice to be “social engineering” nor do I think long term economic stability ids worse then ever spiraling debt. While I think it’s fine for you to have your palatial country manor, I also think the center city should be economically stable enough for the poor and middle class to subsidize the wealthy, since the cost of infrastructure for sprawling developments far exceed the revenues generated by the property taxes. Since 60% of Americans want to live in a neighborhood where daily needs are within walking distance, why is it good to force them to live in your sterile one-size-fits-all housing developments? Why is fiscal responsibility a bad thing? And so far the politicians have been doing just fine with the monolithic planning mandates that force sprawl and the associated traffic congestion on the people. Claude you aren’t advocating for choice at all. You want to divert resources from places that you seem to dislike to place that you seem to prefer. People in Detroit presumably are capable of deciding whether to stay or leave, and I see no reason to try and skew those decisions or deny them options. Maybe Detroit will fade away over time and just be a historical footnote, like Carthage, Babylon or Pompeii. Would that really matter in the grand scheme of things? I’d rather invest in winners than losers. The places you prefer are already heavily diverting resources from other places to pay for infrastructure that they aren’t paying for now. Which is my entire point. The places you prefer don’t generate the revenue to maintain their own infrastructure and have to be subsidized to be able to maintain that infrastructure in a state of ragged decay. These places are “winners” for two reasons. The government takes money from the productive places you don’t like to prop them up and the government zoning laws restrict alternatives to government mandated sprawl. Why is the government mandating a single option considered a free choice? Why is fiscal responsibility considered a bad thing? I might also ask how poor people are expected to move out of the cities and buy magnificent suburban estates when they don’t have any money, but I think your answer will be that America is a free country and we’ll just force them to be free with our only-one-choice-allowed zoning policy. Claude, I think the problem is that you’ve wandered way beyond the scope of this article and into vast national problems of economic inequality that can either only be fixed by a massive change of the national political complexion or, most likely, cannot be fixed at all. But generally speaking it is better to invest in winners and improve the economy, than punish the winners and try and save all the losers. That debate was effectively resolved by Reagan. The discussion started when Jake said, “would it be the worst thing in the world if people lived in “sprawl” development…?” and I said it would be a bad thing to encourage because the revenues generated in a single use sprawl community don’t come close to paying for the cost of maintaining and repairing the infrastructure needed to serve the community. This has nothing to do with touchy-feely liberal ideas about social justice, punishing success or income inequality and everything to do with conservative ideas about fiscal responsibility, economic stability and personal choice. Today zoning laws that mandate sprawling single use developments take away the right of the citizens to choose for themselves and lock the country into a spiraling cycle of increasing debt and decay. Eventually it will collapse. We can’t afford to maintain what we’ve already built. Can it be fixed? Yes. We could raise property taxes to cover the cost of the services and infrastructure. Triple the taxes in many places, increase ten-fold in a few. But asking people to pay for what they use would not be politically popular. We could simply admit that the taxes don’t generate enough revenue and cut off municipal water and cut back road maintenance to balance the income. People can have wells and four wheel drive trucks. This would also be unpopular. Or we could change the zoning laws that mandate new sprawl development and let people choose where they want to live. There is already enough monoculture sprawl to satisfy the market for 20 years, and enough demand for walkable neighborhoods to keep the builders busy for 30. About 60% of Americans want to live in compact, walkable suburbs like were built before the Second World War. Places like Mayberry, in the Andy Griffith Show. Zoning makes those illegal to build without expensive and complicated exemptions, so the few that get built are quickly bid out of reach of all but the wealthy. Change the zoning laws to give people a free choice and the situation will sort itself out without government programs. There might even be enough money to subsidize your sprawl.